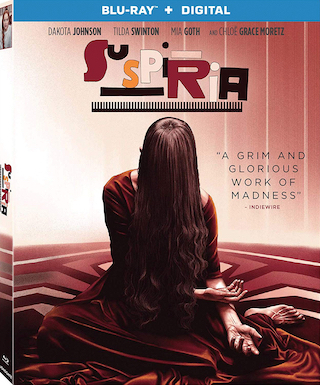 The 2018 version of “Suspiria“ starring Dakota Johnson is coming to Blu-ray Disc on January 29th, 2019 via Lionsgate, according to early alerts to retailers. The film is a remake of the 1977 Argento film. This remake, directed by Luca Guadagnino, co-stars Tilda Swinton, Doris Hick, Malgorzata Bela, Chloe Grace Moretz, Angela Winkler, Mia Goth, Jessica Harper, Alek Wek, Renée Soutendijk, Fabrizia Sacchi, Elena Fokina, and Olivia Ancona. Tech specs for the Blu-ray release have not yet been detailed, but stay tuned for an update. The Blu-ray is now available for pre-order over at Amazon and Best Buy. UPDATE: Bonus materials set to be included on the Blu-ray are listed below.